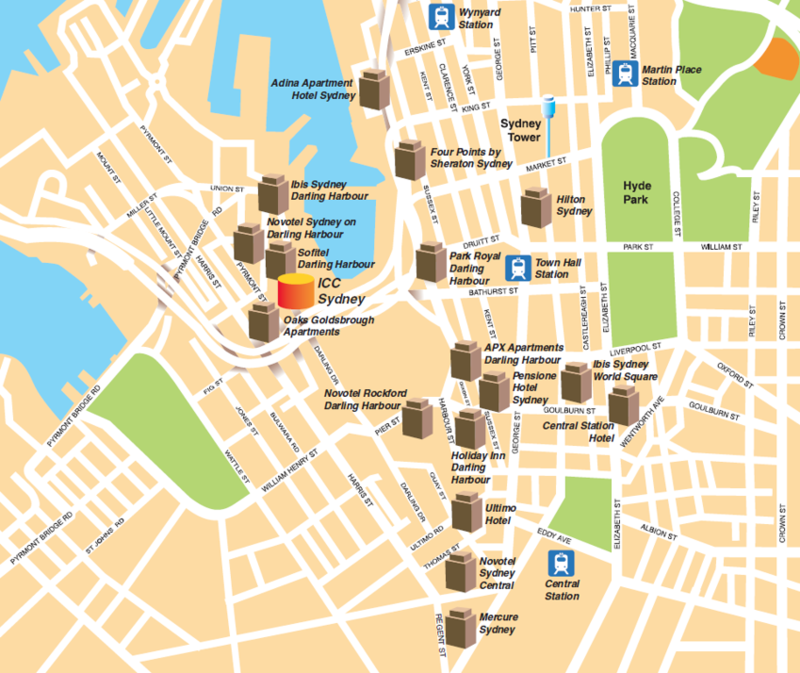 The Conference Secretariat has confirmed rooms at hotels close to the International Convention Centre, Sydney, the venue for 2018 IEEE NSS MIC. You are encouraged to secure your accommodation through the Hotel Management Office booking procedures below to ensure that you receive the negotiated competitive rates. The rates are in Australian Dollars (AUD), inclusive of 10% Goods and Services Tax (GST) which is payable to the hotel chosen. There are no other additional charges to the hotel booking other than a credit card surcharge if paying by credit card. The guaranteed hotel room block is shrinking rapidly and is only guaranteed till October 17. After that only on space availability if even !!! Cancellation Policy: 30-0 Days prior to arrival any nights cancelled are charged in full. Reservation Method: For accommodation enquiries please contact Adriane Pinto (adrianep@icmsaust.com.au). Reservation Method: For reservation please click the following link and use the Login/PROMO Code: IEEE2018. Book here! 1. Via Hilton Link: Book here! 2. Via call: contact hotel direct at: +61 (0)9266 2000 and refer to group code GDYNI to get the discount offer. 3. If any questions relates to accommodation please contact me: lien.pham@hilton.com or +61 (0)2 9265 6047. Accommodation will not be confirmed until a deposit of one night's tariff is received by credit card or full payment by electronic funds transfer or cheque is made. This deposit is forwarded to your hotel. Delegates must settle the balance of their account with the hotel concerned upon check in/out depending on the hotels policy. If required accommodation deposits are not received by 8 October 2018 the room will be released back to the hotel. The Hotel Management Office does not take responsibility for accommodation if deposits are not received by this date. The Conference Secretariat must return all unsold rooms to the hotels/apartments on 17 October 2018, therefore accommodation bookings after this date cannot be guaranteed and must be made directly with the chosen hotel. The rates quoted are only valid for bookings made by 17 October 2018 or until sold out. Late bookings can be made by contacting the hotel directly after 17 October 2018 but are subject to availability and best rate available on the day of booking. Credit card details are required for security of your reservation and are given to the hotel directly at the time of reservation. As check in is at 14:00 at most hotels, your room may not be ready for immediate occupation if you arrive early. Whilst hotels will do everything possible to accommodate early arrivals, if you wish to be guaranteed immediate occupation you can pay an extra day's tariff for the night before you are due to arrive. If you wish to take this precaution, please advise the Congress Secretariat on the registration form so that we can notify the hotel. Please indicate if you will arrive at your hotel after 18:00 on the day of check in. This is a courtesy to the hotel so they are to expect you to arrive later. If you are late due to unforeseen circumstances, the hotel will hold your reservation for the nights pre paid. Failure to no show at the hotel, will be charged in line with the cancellation penalty.